Constellation Ophiuchus the Serpent Holder, is a northern constellation sitting above constellation Scorpio, grapling with the Serpent, constellation Serpens. 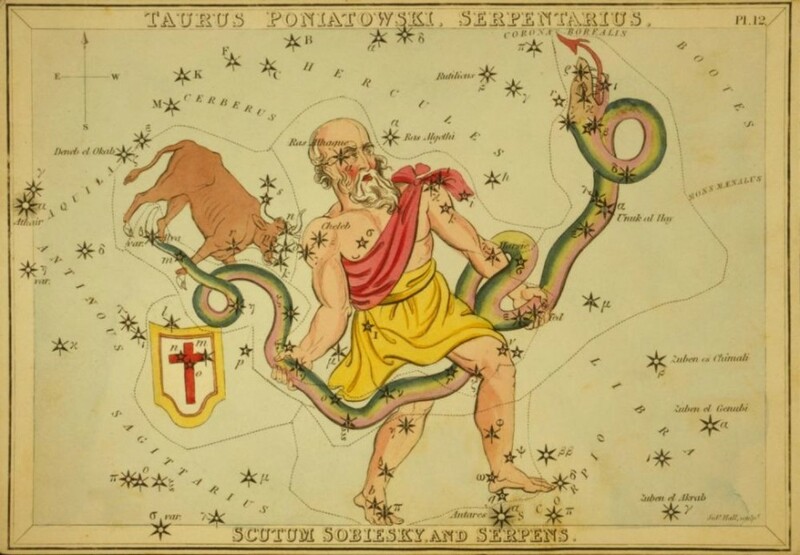 Ophiuchus spans 30 degrees of the Zodiac in the Signs of Sagittarius, and and contains 8 named stars. Ophiuchus vel Serpentarius, the Serpent-Holder stretches from just east of the head of Hercules to Scorpius; partly in the Milky Way, divided nearly equally by the celestial equator; but, although always shown with the Serpent (Serpens), the catalogs have its stars entirely distinct from the latter. The original title, Ophioukhos, appeared in the earliest Greek astronomy; mogeros, “toiling,” being an adjectival appellation in the Phainomena. Cicero and Manilius had the peculiar Anguitenens. Golius insisted that this sky figure represents a Serpent-charmer, one of the Psylli of Libya, noted for their skill in curing the bites of poisonous serpents; and this would seem to be confirmed by the constellation’s title le Psylle in Schjellerup’s edition of Al Sufi’s work. But the Serpent-holder generally was identified with Asklepios, Asclepios, or Aesculapius, whom King James I described as “a mediciner after made a god,” with whose worship serpents were always associated as symbols of prudence, renovation, wisdom, and the power of discovering healing herbs. Educated by his father Apollo, or by the Centaur Chiron, Aesculapius was the earliest of his profession and the ship’s surgeon of the Argo. When the famous voyage was over he became so skilled in practice that he even restored the dead to life, among these being Hippolytus, of whom King James wrote: Hippolyte. After his members were drawn in sunder by foure horses, Esculapius at Neptune’s request glued them together and revived him. But several such successful operations and numerous remarkable cures, and especially the attempt to revive the dead Orion, led Pluto, who feared for the continuance of his kingdom, to induce Jove to strike Aesculapius with a thunderbolt and put him among the constellations. Euphratean astronomers knew it, or a part of it with Serpens, as Nu-tsir-da; and Brown associates it with Sa-gi-mu, the God of Invocation. Just as we read the first constellation of the woman and child Coma, as expounding the first sign VIRGO, so we have to read this first constellation as expounding the second sign LIBRA. Hence, we have here a further picture, showing the object of this conflict on the part of the scorpion. In Scorpio we see merely the effort to wound Ophiuchus in the heel; but here we see the effort of the serpent to seize THE CROWN, which is situated immediately over the serpent’s head, and to which he is looking up and reaching forth. 1. Fixed Stars and Constellations in Astrology, Vivian E. Robson, 1923, p.54. 3. Star Names: Their Lore and Meaning, Richard H. Allen, 1889, p.297-300. 4. The Witness of the Stars, E. W. Bullinger, 10. 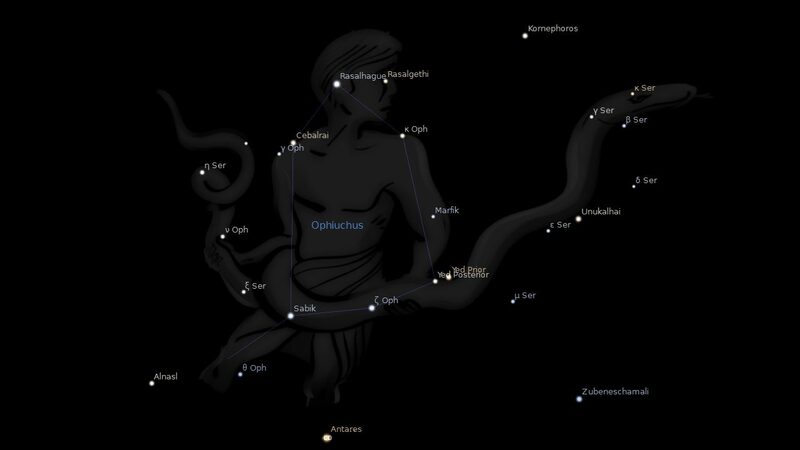 Ophiuchus (the Serpent Holder).